The government has admitted "overselling" the advantages of national identity cards. Tony McNulty, the Home Office minister responsible for the project, told a left-wing think tank ID cards would not be a panacea for terrorism or fraud. But the government remained committed to the scheme - despite the high cost. His comments have prompted the Conservative and Liberal Democrats to renew demands for the ID card project to be abandoned. In the private seminar for the Fabian Society, Mr McNulty also said a battle between the Houses of Commons and the Lords about whether the cards become compulsory would end in deadlock. The government intends for both Houses of Parliament to have to vote in favour of compulsion - a decision not due to be taken until about 2012. Mr McNulty said the procedure was "an algorithmic recipe for deadlock because it does not resolve the situation if one house says yes and the other says no". The minister is quoted as saying at the seminar: "Perhaps in the past the government, in its enthusiasm, oversold the advantages of identity cards. "We did suggest, or at least implied, that they might well be a panacea for identity fraud, for benefit fraud, terrorism, entitlement and access to public services." In its "enthusiasm", the government had over-emphasised the benefits to the state rather than for "the individual in providing a gold standard in proving your identity", he said. "There are now so many almost daily occasions when we have to stand up and verify our identity." ID cards might help where fraud and abuse of identity were "part of the equation", but they would not solve the problems, he said. Mr McNulty said ministers would announce a "ceiling" on the cost of each ID card in October to try to restore confidence after speculation it could be up to £300. 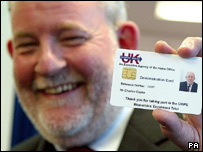 After the London bombings, which killed more than 50 people and injured many more, Home Secretary Charles Clarke said ID cards would not have stopped the bombers. But on balance he believed ID cards would help rather than hinder the ability to deal with particular terrorist threats. Conservative shadow home secretary David Davis said Mr McNulty had "let the cat out of the bag". "This scheme will cost the taxpayer billions of pounds, be fraught with practical difficulties and have a serious impact on our civil liberties," said Mr Davis. "Having admitted they tried to spin this project in the absence of any real substance, the government should now come forward and address the many real concerns of the public." Liberal Democrat President Simon Hughes said the problem police faced was not proving suspects' identities, but that they did what they were suspected of doing. He also said the multi-million pound cost of the scheme could be better spent on improving police presence on the streets. "Let's spend the money on the sorts of things that really give security, not on something that gives an illusion of security but actually won't do most of the jobs at all." Labour MP John Denham, chairman of the Commons home affairs committee, urged the government to clarify its position. "If the government is backing off ID cards I think they need to say so because that would be a very big mistake," he said. Fabian Society general secretary Sunder Katwala said Mr McNulty's words were just part of the government moving to another stage of the debate.